Silks & Cyr: a world unique show! Never seen before like this – the combination of a spectacular and expressive Cyr Wheel performance with the elegant and beautiful movements in the Aerial Silks. Two artists, two different disciplines; combined into one overwhelming show act. A world unique production! The act starts as a duet on the ground performing partner acrobatics. They separate to perform Cyr Wheel and Aerial Silks simultaneous. As a highlight, the artists reunite together in the air for a duo silk choreography. This show fills spacious locations, a perfect act for major events. The silk fabric hangs from the ceiling and takes a leading part while the Cyr Wheel is spinning on the ground. It magically circles around the Silks and all movements harmoniously connect. An interplay of gender, feminine elegance and masculine strength! The steady action creates dynamic choreographies with constantly changing impressions. A perfect combination to enthral the audience! 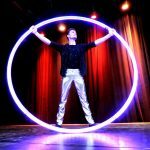 Book this high energetic performance if you want to impress your guests with a world unique show. Emotional and stirring, acrobatic to be impressed! Customization: Adaption to special wishes is possible. Theme, outfits, music and duration is flexible and individually selectable on request.